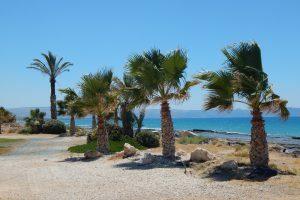 Cyprus has warm and sunny weather all year-round without extreme hot or cold temperatures. In the Summer temperatures can reach 90 degrees, but cool Mediterranean breezes temper the heat. 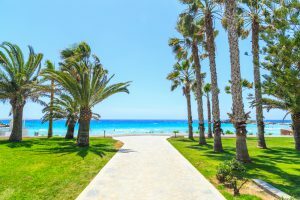 Cyprus has warm and sunny weather all year-round without extreme hot or cold temperatures. In the Summer temperatures can reach 90 degrees, but cool Mediterranean breezes temper the heat. Winters are mild with some rain and snow in the Troodos Mountains. Spring and autumn are quite warm and pleasant. 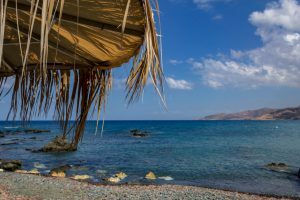 There are ancient settlements everywhere you go which are reminders of the Islands 10,000 year history and its incredibly diverse scenery ranges from dramatic pine clad mountains to secluded coves gently washed by the sparkling warm waters of the Mediterranean sea. With two modern and well equipped international airports, you will that find many of the charter and budget airlines fly to the island all year round, as well as many scheduled flights from all over Europe. 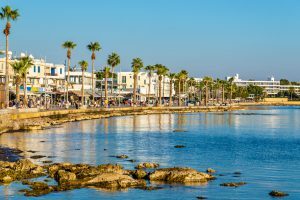 Both of the Cypriot airports are situated on the South coast of the Island with Paphos airport, in the west, dealing mainly with charter flights whereas Larnaca airport, in the east, has both charter and a wide variety of scheduled flights. 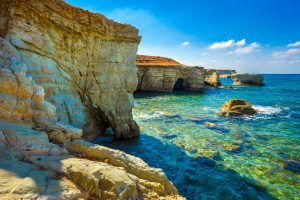 Why Choose a Holiday on Cyprus? Agni Travel can arrange a hire car (or taxi transfer) to be waiting for you at the airport. The road network is excellent with the added bonus of driving on the left-hand side !! The impressive Troodos mountain range stretches across most of the western side of Cyprus offering a cool sanctuary in which you can spend idyllic hours walking or driving in its scented pine forests. There are nine Byzantine churches in the Troodos mountains which are included in the official UNESCO list of cultural treasures of the World’s heritage and these are: Stavros tou Ayiasmati, Panayia tou Araka, Timiou Stavrou at Pelendri, Ayios Nikolaos tis Stegis, Panayia Podithou, Assinou, Ayios loannis Lampadistis, Panayia tou Moutoula, and Archangel Michael at Pedhoulas. In the summer of 1974, the Greek military junta then in power backed a coup on the island and declared it a part of Greece. Turkey responded with 45,000 troops and occupied the northern part of the island. The Greek junta subsequently collapsed and the island was divided into the Republic of Cyprus and the Turkish Republic of Northern Cyprus. 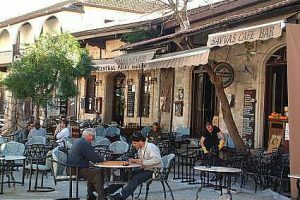 The two sides almost reached an agreement in a 2004 initiative brokered by the U.N., but although the plan was accepted by Turkish Cypriot voters, Greek Cypriot voters rejected it. You can enter and stay in North Cyprus as long as you wish with the border formalities at currently three check points minimal. You may even cross with a Greek rent a car as long as it has insurance valid for the North. (Easily available at the border). 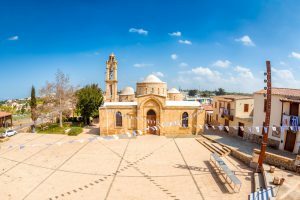 Cyprus is a country with over 4000 years heritage in great wines and has contributed substantially to the development of viticulture throughout the world. Over the centuries Cyprus has retained a strong tradition in fine wine production. In the past grapes were being collected by the farmers in the countryside, this usually took several days until the lorries were loaded for the grapes to be transported to the major wineries in Limassol. The grapes thus suf­fered considerably in the sun or the occasional rain, and the juice of the ripest grapes was lost during the long wait until finally reaching the winery. Nowadays grapes are collected and packed in small crates, replacing the large traditional baskets carried by donkeys. The crates are then delivered by pick-up trucks to the winery. The grapes thus arrive at the winery in perfect condition for the production of high-quality wine. Most Cyprus vineyards are small and grow indigenous varieties of grapes for wine. Donkeys and oxen are still used to plough some of them. Cultivated vineyards cover a large percentage of the country’s hilly and mountainous land, from sea level up to 1,500 meters, predominantly on the southern slopes of the Troodos in the Lemesos district and the southwestern in the Paphos district. 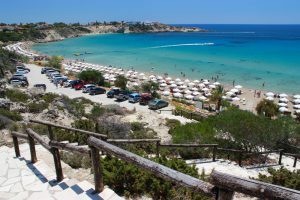 Lara Bay located in the Akamas peninsula is an extremely important turtle breeding ground and here you can find the green turtles and hawksbill turtles. These turtles are on the endangered species list and Lara Bay is a safe haven for them. 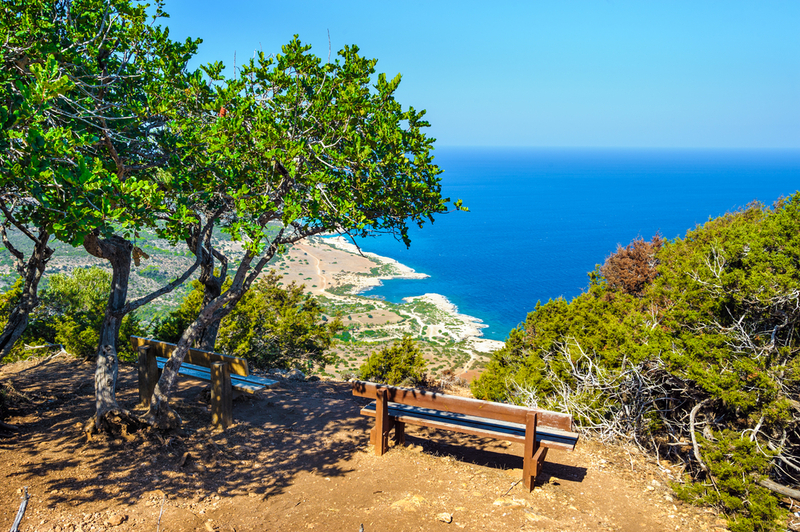 The Akamas peninsula has been included in the European Council’s protection programme and it was recommended that this are be treated as a biosphere reserve that is to include a large National Park area. Friends of the Earth and Greenpeace have also campaigned to have the Akamas Peninsula declared a National Park area in order to protect the large amount of unique fauna that can be found here. 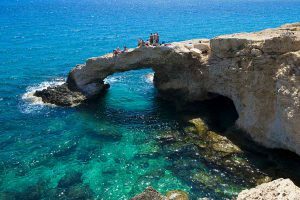 Warm seas, clear water, and year-round sunshine ensure that diving in Cyprus remains a popular pastime. The varied nature of the dive sites, as well as the lack of tides and currents, means that both beginners and more experienced divers can enjoy the experience. There’s plenty of underwater life and a huge variety of fish will be vying for your attention. If you’re lucky you might bump into tuna, barracuda or the occasional turtle. Throw in a few wrecks, some ancient settlements plus the odd coral reef and you’ve got pretty much everything you could want.